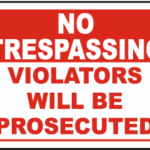 Trespass in North Carolina is a criminal charge that can lead to wide array of criminal consequences. Because of that it would be best to contact a criminal defense attorney if you are ever faced with that situation. In North Carolina, a criminal defense attorney would be able to help explain criminal charges of trespass to you. Criminal Trespass can be in the first degree or second degree, depending on the facts and circumstances under which you were charged with the crime. The different trespass charges are not the same. In addition, they have different criminal consequences. The criminal defendant is found on the premises for another, and that premises was so enclosed or secured that it clearly demonstrated that intruders were not welcome. If found guilty of first degree trespass, the defendant faces criminal penalties of a class 2 misdemeanor. Your criminal defense attorney can explain what the likely punishment will be. Indicators on the premises are posted in a manner reasonably likely to come to the attention of intruders, with notice not to enter the premises. If found guilty of second degree trespass in North Carolina the defendant faces criminal penalties of a class 3 misdemeanor. Your criminal defense attorney can explain what they likely punishment will be. A domestic criminal trespass is a Class 1 Misdemeanor and carries up to 120 days in jail. This charge can be escalated to a Class G Felony if you trespassed on property being used as a safe house for victims of domestic violence and you were also armed with a deadly weapon at time of offense. A Class G Felony carries up to 21 months in prison for first time offenders. But this charge can be increased substantially depending on the circumstances of your case. If you have been charged with domestic criminal trespass, it is in your best interest to hire a criminal defense lawyer right away to receive the best possible outcome. So if you have been charged with trespassing. contact us. If you are charged with trespass in North Carolina, it is best to contact a criminal defense attorney as soon as possible. Your criminal defense attorney can go over your case with you and explain your best options for defense, and the likely consequences you may face.